Vélo Québec has just published a new guidebook in their "Les guides vélo mag" series. So, what's special about these 30 bike rides? Quebec is a big place and the book has interesting rides in every region. The rides were submitted by readers of the Quebec cycling magazine Velo Mag. This is probably a good thing. We all have favorite rides. Here are 3o favorite rides. This has to be a good thing! We looked through the guidebook in detail and the rides look great. The book should get riders to ride and discover the beauty and downright joy to be had out in the Quebec countryside. Cyclists on the weekends should leave Montreal island. Many rides quite similar to some of our favorite rides are featured in the book. Strangely, one rides out favorite northern Lanaudiere ride in reverse, with long climbs and short and steep descents. That is the opposite of what it should be! We strongly recommend this book to anyone who is looking to leave Montreal island to find a great ride. 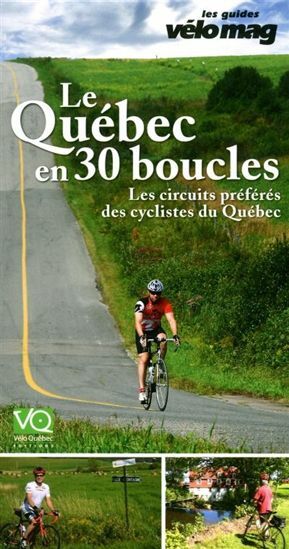 Quebec is full of great road bike rides, and if you love road riding then this book is essential. We'll blog more about the rides and this guidebook in future posts. À l’invitation du magazine Vélo Mag, les cyclistes de tout le Québec se sont prononcés : voici leur sélection des plus beaux parcours de la province. De l’Abitibi-Témiscamingue à la Gaspésie en passant par les Laurentides et les Cantons-de-l’Est, découvrez des coins de pays magnifiques et méconnus, de même que les cyclistes qui les ont choisis et les histoires et trésors qui colorent ces parcours inédits. Que vous ayez envie d’une balade contemplative ou d’un défi exigeant, ce guide est pour vous ! Do you think those loop can be put toguether for do a big LOOP around Quebec. I am planning to do a 2 weeks bike journey in Quebec. this would be conceptually challenging, but it is always useful to know what are the interesting rides in each region when doing route planning.